Calculation of Hartree-Fock energy derivatives in polymers. Advanced Monte Carlo methods for the atomistic simulation of polymers with a linear or non-linear molecular architecture. A method for the systematic estimation of parameters for a stochastic reptation model. Implicit micro-macro methods in viscoelastic flow calculations for polymeric fluids. Estimation of critical parameters from QM. Micro-macro 3D calculations of viscoelastic flow. The derivation of size parameters for the SAFT-VR equation of state from quantum mechanical calculations. Implicit Viscoelastic calculations using Brownian configuration fields. Monomer solubility and diffusion in confined polyethylene by mapping atomistic trajectories onto the macroscopic diffusion equation. Detailed atomistic simulation of the barrier properties of linear and short-branched polyethylene melts through a hierarchical modeling approach. From polyethylene rheology curves to molecular weight distributions. Computer aided polymer design using group contribution techniques. Design of polyolefin reactor mixtures. Atomistic molecular dynamics simulation of short-chain branched polyethylene melts. Hierarchical approach to flow calculations for polymeric liquid crystals. Modelling in polymer materials science has experienced a dramatic growth in the last two decades. Advances in modeling methodologies together with rapid growth in computational power have made it possible to address increasingly complex questions both of a fundamental and of a more applied nature. 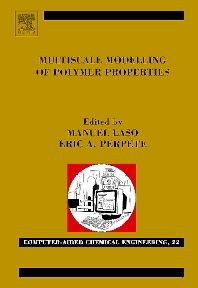 Multiscale Modelling of Polymer Properties assembles research done on modeling of polymeric materials from a hierarchical point of view, in which several methods are combined in a multilevel approach to complex polymeric materials. Contributions from academic and industrial experts are organized in two parts: the first one addresses the methodological aspects while the second one focuses on specific applications. The book aims at comprehensively assessing the current state of the field, including the strengths and shortcomings of available modelling techniques, and at identifying future needs and trends.